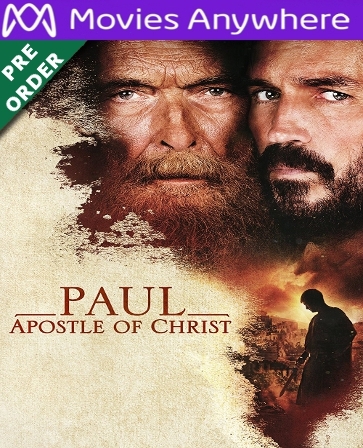 Digital UltraViolet and Digital Copy will makes it possible for you to stream the movie Paul, Apostle Of Christ UV or iTunes Code instantly to your computer and compatible Smartphones, Andriod, iphone, iPod Touch, iPad and tablets devices anytime, anywhere. You can also download a Digital UltraViolet Copy or a Digital Copy of the movie Paul, Apostle Of Christ UV or iTunes Code to your computer and compatible devices. Paul, who goes from the most infamous persecutor of Christians to Christ’s most influential apostle, spends his last days awaiting execution by Emperor Nero in Rome. Paul is under the watchful eye of Mauritius, Mamertine Prison’s ambitious prefect, who seeks to understand how this broken old man can pose such a threat. As Paul’s days grow shorter, he feverishly works from prison to further the Gospel of Jesus Christ, and embolden his followers to stand strong in their faith against Roman persecution far greater than has ever been seen.